The legendary Flamingo club has undergone many refits over the years (gay since 1980) but the latest project was the most ambitious ever. 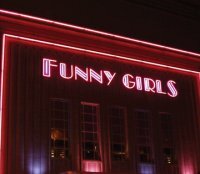 It has transformed the club into the largest 7-day-a-week venue in Europe and is now regarded as a major touring venue for larger-than-life PA's and Groups. Flamingo's has also now relocated to its new home. After a multi million pound refix, the excellent venue has numerous bars, huge dancefloor and a state of the art light and sound system. The music is excellent and the club is packed at weekends with a young attractive crowd. Open Monday, Wednesday -Thursday, Sun 11:30pm-5am; Friday 11pm-5am; Saturday 11pm - 6am; also open Tue. 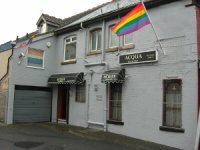 Acqua Sauna Complex - The North West's longest running and busiest sauna complex for gay, bi-sexual and bi-curious men. Kaos Bar is a Blackpool gay venue offering top music, cabaret and cheap drinks offers. Host to resident drag artiste Stella Artois, one of the funniest most candid drag queens in the North West! Regular male strippers and other cabaret. Fun, camp bar with large dancefloor and outside smoking area. Blackpool fun pub / show bar with regular cabaret and drag DJs. Roxy's is a picturesque venue boasting top quality entertainment 7 nights a week. With 5 levels to explore, there is a plush balcony to the front of the venue with amazing views of Queen Street, The Irish Sea & The Illuminations. We also have a choice of 4 bars where you can quench your thirst. 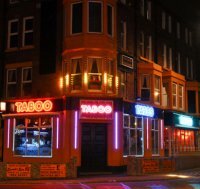 The Taboo Bar (formally Queen Vic's Bar) located on the corner of Dickson Road, opposite Funny Girls is the latest Bar to open in Blackpool's vibrant entertainment district, the location couldn't be better to serve as an ideal starter for your night. NB not sure if this bar is still open. Hugely popular gay venue. Non-stop music and cabaret all week from vocalists to bands and drag shows to specialist acts. Make The Flying Handbag your port of call each week and savour the very best in musical entertainment.